Cake Walk - The Chip's Challenge Wiki - The Chip's Challenge Database that anyone can edit! Cake Walk is the 146th level in Chip's Challenge 1. 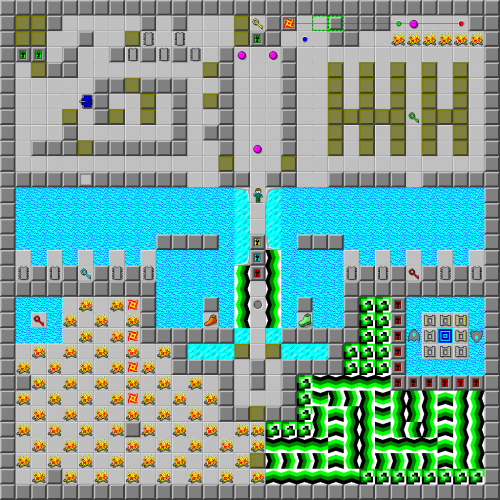 It is the second of five secret levels in MS, and the first of four in Lynx. Despite its name, Cake Walk is not a cake walk. It is respected and hated by all Chipsters alike. 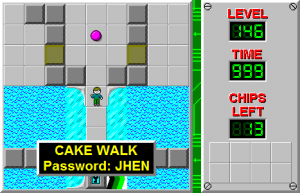 Cake Walk's upper section contains a lot of block pushing; 33 blocks are required to reach the eight chips and red and blue keys placed in the water pool, and the other five chips and a yellow key are available above that, near bouncing pink balls. To see the water section in full, view the map below. Chip has 33 blocks available on the right and two that are usable near the start. One is highly recommended (though not absolutely necessary) to stop the fireballs, and since the five chips and yellow key take Chip around to the west side anyways, he can use the one left to the start, allowing one block to be trashed for greater flexibility in block pushing. Originally, it was intended that the blocks to the left be used as well; Chip can, instead, bridge through the center and use the ice to his advantage. Since detailing every move would be impossible in this guide, that is left to the job of the AVI. At the beginning, Chip deflects a couple of fireballs into the bouncing balls, distorting their paths. Since Chip will be using pairs of blocks, those two blocks will have already been close to these positions in a possible route and it takes little extra time to perform this. When Chip starts building west of the start, the spring slide is used to speed up the return to the blocks: Chip can move faster across bunches of sliding tiles with acting floor between them if, while not decreasing the number of sliding tiles used, spacing them out from simply one floor space in between. The boosting then works over floor, which utilizes the full potential of the extra speed instead of wasting half of it. An example can be found when Chip removes his first water space on the left side; instead of 3R 2U, a faster method is RU 2R U. While difficult and with perfection necessary for 712, missing this boosting tends not to cause any further losses. With all chips and keys taken, open the blue lock and red lock (the yellow lock has been removed during the spring slides), then move the block on the right R, wait  before following to avoid being hit, and push the block and wait [1/2] in front to avoid block echo. The suction boots can the be taken, and the fire boots are accessed the same way, but this time Chip has to walk 2L to them rather than being deposited L off them. With fire boots, push the next block 2D 14L 7U into the water to collect a second red key. Move to the force floor jumble and open red lock 4 on the south edge, and move the block R, which will send it into that open space to allow Chip to reach the exit. The bold time for Cake Walk is 717, set by David Stolp, with a newsgroup post on April 1st, 2015 revealing that his 717 is not the heavily random route previously known to reach 717. This pushes the Melinda time further out, but how far is unknown. To score the random 717, Chip would have to drop the last block 2U R and the random force floors would have to hold the block long enough for Chip to open the red lock and get out of the way safely. Depending on how close the encounter is with the block on the DL move off the red lock, Chip can score as many as five extra seconds, but it is very unlikely any player will ever achieve it. Cake Walk's bold time has had the most changes in the history of Chip's Challenge: a total of 25. The gliders at the very end are the last monsters in CC1. This page was last edited on 9 March 2019, at 17:54.